Ilur was designed after Aber as a larger boat capable of family day sailing. It can be used for fishing and even coastal cruising. Two Ilur have been to Ile of Sein, at the extreme West of France, one of the worst places to go, with tremendous tides and terrible sea conditions. Don't consider this as an invitation to go there! Length was increased by 20 cm, but Ilur is mostly wider and higher, with generous freeboard. This makes it a very different boat, with good seakeeping ability, but still in the sail and oar spirit. Its superior quality makes Ilur my best-selling plan (with nearly thousand copies sold). It has been built in many places, from the very heart of the Alps, to the Pacific islands! If you have to choose the best boat for your intended use, notice than Ilur is not as easygoing a rowing boat as other of my sail and oar designs. She is mainly intended for sail, oars being used when the wind is falling or to reach a narrow inlet. The dagger-board was initially chosen in order to give more room for the crew. It has been replaced by a pivoting centerboard and a low centerboard case which is not at all cumbersome. Many other improvements are continuously made. As an example oars may be stowed under floorboard, leaving the cockpit free when sailing. 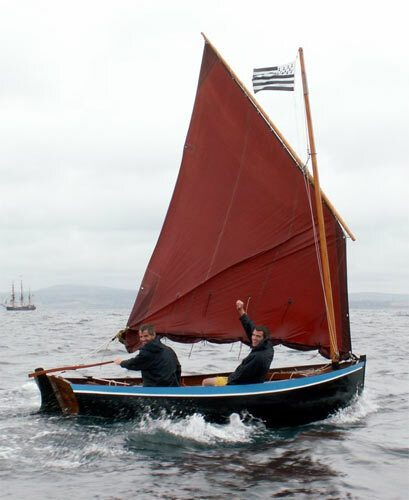 Ilur was originally designed with a simple lug sail in the Breton style (called a "misainier" rig). A lug sloop rig is now available and is a valuable option. 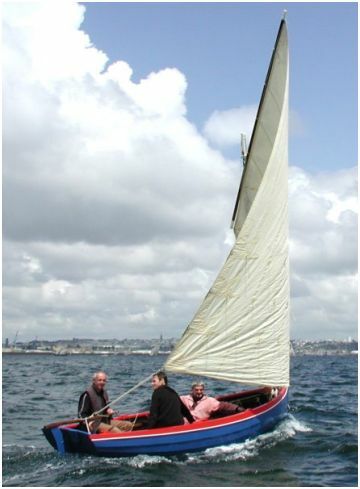 A balanced lug rig (lug sail with boom) is an other option, useful for river or single-handed sailing. Construction is either strip planked or plywood clinker (lapstrake). In both cases, laminated or steam bent frames give a very traditional and beautiful look. The very detailed plans and instruction booklet allow construction by any home builder. 4.46 m - 14' 8"
4.06 m - 13' 4"
1.68 m - 5' 6"
180/210 kg - 397/463 lbs.